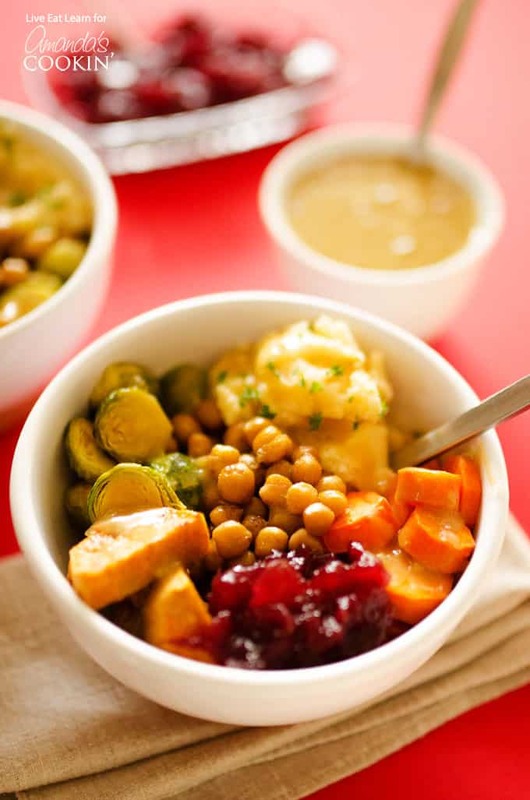 Easy Thanksgiving Leftovers Bowl: pile those leftover in a bowl! These Easy Thanksgiving Leftovers Bowls take all of your delicious Thanksgiving leftovers and transform them into a delicious one bowl meal! Pack it with plant-based power by using chickpeas, or substitute in leftover turkey for a comforting meal that’s ready in no time. Brace yourselves…Thanksgiving is coming. And while I’m sure you’ve thought through what you’ll be making on the big day, have you thought about the days after? When you’re completely exhausted and wondering what the heck you’ll do with all those leftovers, this Easy Thanksgiving Leftovers Bowl will have you covered. You may be wondering how exactly putting all of these leftovers in a bowl can actually taste good. Answer: it just does. 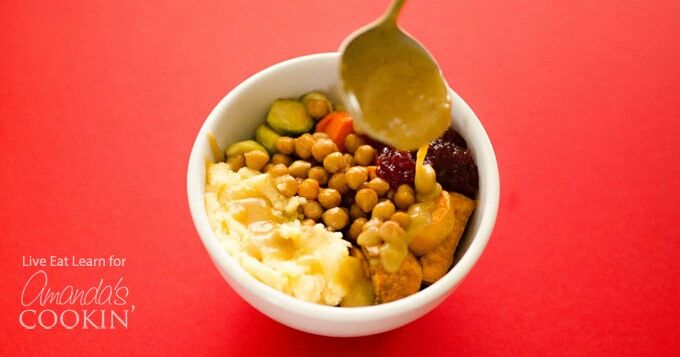 The saltiness of the vegetables with the tart cranberries and creamy potatoes combines into a bowl that perfectly balances taste and texture. So without further ado, let’s rock and bowl. 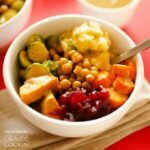 These Easy Thanksgiving Leftovers Bowls take all of your delicious Thanksgiving leftovers and transform them into a delicious one bowl meal! Whisk to combine olive oil, 1 tsp salt, cinnamon, pepper, and cumin. Toss sweet potato chunks through the oil mixture, then use a slotted spoon to remove and lay on a large parchment paper lined baking sheet. Add chickpeas to what is left of the oil mixture, toss to coat, and spoon onto the same baking sheet. Throw Brussels sprouts and carrots onto the baking sheet, sprinkling each with a pinch of salt, and drizzling honey over the carrots. Cook at 400 degrees F (204 C) for 25 minutes, or until veggies are fork tender. If you’re making the vegetarian gravy, heat oil in a saucepan over medium heat then add onion and garlic. Cook until translucent (a few minutes), then add soy, nutritional yeast, and flour. Stir to combine then slowly pour in broth, stirring continuously. Bring to a simmer then cook until gravy reduces to a thickness of your liking. Cover to keep warm and set aside. 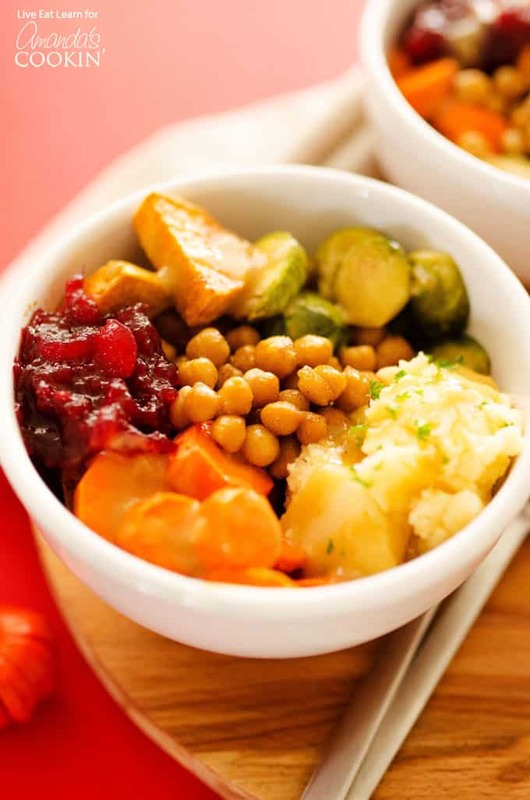 Heat up your leftover mashed potatoes in the microwave just before veggies are done cooking. To assemble, spoon mashed potatoes into the bottom of a bowl 2 or 3 serving bowls. Top equally with each of the veggies, adding more mashed potatoes on top if you’d like. Spoon on a dollop of cranberry sauce. 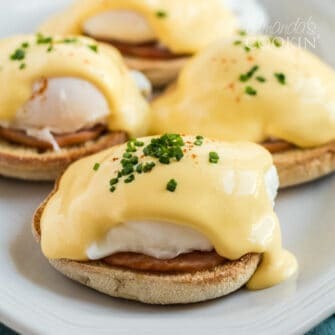 Drizzle with gravy and serve warm! *You can sub in leftover turkey for the chickpeas. **If you’re not vegetarian, just use leftover turkey gravy!